approach for Ranam. There is no rope technique or such. I wanted Ranam to be a honest and relatable movie and the script demands such an approach," says Nirmal. drama. Prithviraj plays a character who is lying low," he adds. Isha Talwar, who wowed audiences in Thattathin Marayath and Bangalore Days, will make her comeback to Malayalam through Ranam. She has replaced Mamta Mohandas, who was initially cast for the role. And, according to Nirmal, Isha is all set to stun the audience with her stupendous performance. "The real challenge is in giving the female lead a meaty role. 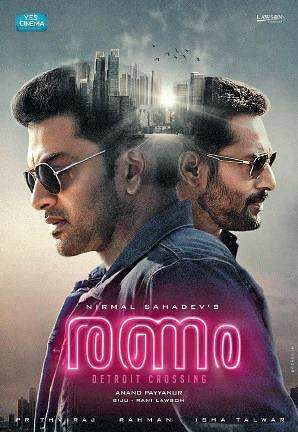 Ranam, despite being an action thriller, will have Isha playing a well-fleshed-out character. She has done a great job and her new avatar will be a treat to watch," says Nirmal, who has also scripted the recently-released Hey Jude. The post-production is in progress. It is likely to hit the screens by the end of March. A cross-over film, Ranam, also titled Detroit Crossing, has Rahman too in a prominent role. It was shot in Atlanta.